In the past the only way to add an additional monitor to MacBook or Laptop was to connect an external monitor through a cable or desktop-bound PC. Now, GeChic has found a way to add another more flexible way by introducing a portable monitor they call the On-lap monitor. The on-lap 1301 can be used with MacBooks or laptops and we even set it up with their trademark green stands as an on desk monitor. The GeChic On-lap monitor’s strongest selling point is its clever design. The display has four suction pads that stick it securely to the back of the laptop, before its screen swings out to extend your screen. The additional screen can also be folded back to be used as a screen for presentations. 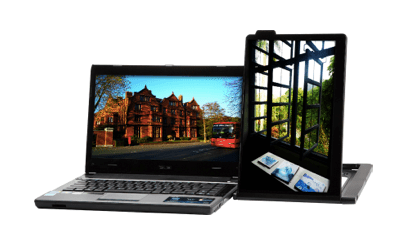 The On-lap monitor’s 13.3-inch screen has 1,366 x 768 resolution and comes with a USB cable to take power from the laptop. It comes with both HDMI and D-SUB cables that can be connected to the display source. It’s worth noting that it will add around 860 g to the notebook’s weight and thicken it by 14 mm, so it isn’t a good idea to attach it permanently when you’re on the move. As mentioned before you attach the GeChic On-Lap with four suction cups which by all accounts are very sturdy (not in a climbing up windows kind of way but you get the picture). 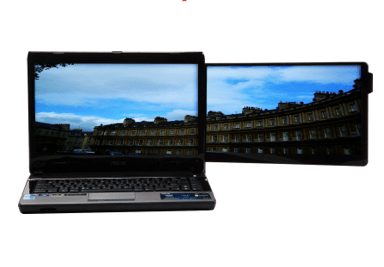 You plugin the HDMI cable or VGA and you’re up and running without the need for drivers, you may have to switch dual displays on when using Windows but this is hardly a chore. Windows or applications can then be dragged onto the external monitor so you can view two things at the same time. Being an add-on, one should not expect much from the On-lap when it comes to image quality. It does not perform as well as the dedicated macbook screen, so if you’re working with photos and depend on the screen to make the best possible image quality, you may use your laptop’s main screen. It is, however, a perfect screen for office work, web browsing and general applications not dependent on HD visuals. The GeChic On-lap monitor is an easy way to add more space to your screen, making work easier. The benefits of having a separate screen whilst working or surfing the web is untold, especially in today’s multitasking heavy environment. This sweet device is available for £121 too, a snip for people that need dual screens or a luxury for those who just love gadgets.